A seemingly innocent announcement—the development of a large island in the scenic Far East with cooperation of the two neighboring countries Russia and China—brought reactions of disgust from Chinese netizens. In a sit-down meeting with Russian President Vladimir Putin, Deputy Prime Minister and Presidential Plenipotentiary Envoy to the Far Eastern Federal District Yury Trutnev, said preparation would be made for the development of the Bolshoi Ussuriysky Island, in cooperation with China, according to the transcript published by Russia’s Presidential Office on Jan. 19. Trutnev stated that a financial incentive in the form of a free hectare of land would be given to any individual willing to move to the island, as well as to current residents. China’s state-run newspaper, Cankao Xiaoxi, which is owned by Xinhua News Agency, reported on the development, saying that an international resort would be built on the island, and a visa program would also be implanted as part of the development plan, reported on Jan. 20. What Xinhua did not report is that China should have had exclusive rights to the development of the island. Russia returned half of the Bolshoi Ussuriysky Island, also known as Heixiazi Island, to China in 2008, after refusing to return the island to China in 1929 after signing of the Khabarovsk Treaty, at the conclusion of a conflict between Soviet Union and China. 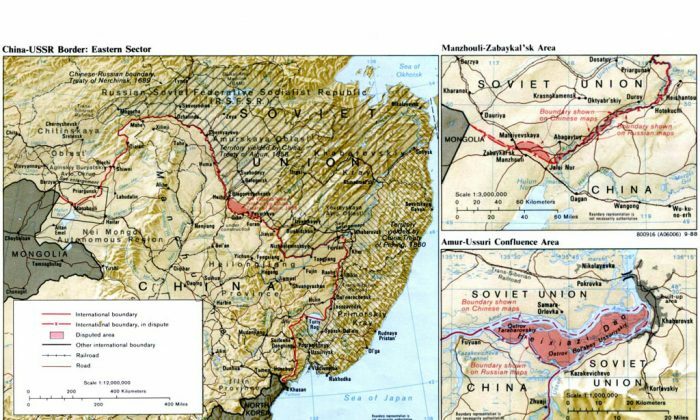 The agreement permanently redefined the border between Russia and China, and China permanently lost vast territories that had originally belonged to it. The territorial concession was the result of China wanting to flex its muscles on international affairs, as it was heavily dependent on crude oil, natural gas, and military hardware from Russia. On the popular online forum Kdnet Chinese netizens have reacted with outrage to Russia’s development proposal. Recently, a North Korean soldier crossed the border into China and robbed and killed four villagers.